If you miss the old AutoText feature in Word 2016, you can pretend that AutoCorrect is AutoText. AutoCorrect’s second feature (after fixing capitalization errors) is replacing common typos and other text with correct versions. This feature is similar to the old AutoText feature, beloved by Word users from generations past. The first set of corrections converts common text abbreviations into their appropriate symbols, such as (C) into the copyright symbol, ©. 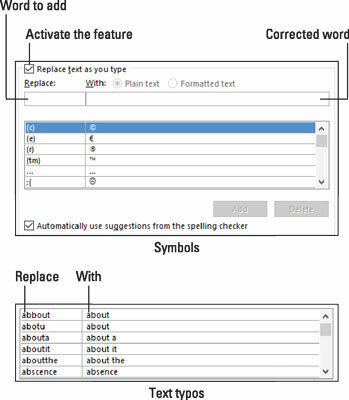 These symbols are located at the top of the list of Replace Text As You Type list, illustrated here (top). Beyond symbols, AutoCorrect’s replace-text list includes common typos, shown at the bottom of the figure. When you type one of the items on the left side of the list, Word automatically inserts the proper text on the right — providing that the Replace Text As You Type command is active. In the Word Options dialog box, choose Proofing on the left side. The AutoCorrect dialog box appears with the AutoCorrect tab up front. Ensure that there’s a check mark by the option Replace Text As You Type. When the check mark is present, the feature is active. To add another word, such as break to replace braek, continue with Step 5. In the Replace text box, type the word you frequently mistype. In the With box, type the word to replace the mistyped word. Click OK to close the AutoCorrect dialog box, and then OK to close the Word Options dialog box. You can repeat Steps 5 through 7 to add a number of your favorite typos. Whenever the word you specify in Step 5 is typed, the word you enter for Step 6 replaces it automatically.